We are excited to have been announced as one of Google’s top 50 agencies in their Grow Local campaign! Our hard work on our client’s PPC accounts means we’ve been invited along to an exclusive Grow Local Garden Party hosted by Google to celebrate their top 50 agencies. We are really looking forward to attending and meeting other agencies from all over the country. Sleeping Giant Media has been involved in many Google Partner events, including having training visits from Google and, most recently, when we hosted our own Grow Local meetup at Giant HQ. Grow Local is a Google initiative for Google Partner agencies to work with local businesses and champion the way that we help and work with them to succeed online. We are also lucky enough to have been sent a gorgeous hamper from Google Partners as a ‘well done’ for being one of the first agencies to reach a set revenue for a new client spend in their Grow Local Challenge. 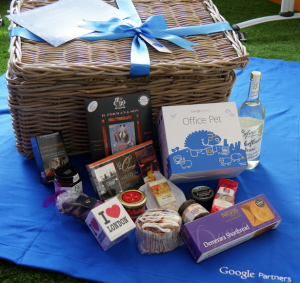 The hamper was created by Spicers of Hythe, one of our clients, and is filled with some really yummy looking treats and Google goodies. We can’t wait to tuck in!